Please find a PDF copy of this note here. Discontinue the assessment for PIX Hardwood Chip Global. Launch a new PIX Hardwood Chip Asia index. The move is intended to make the PIX Woodchip global indices more distinct and relevant for the industry. 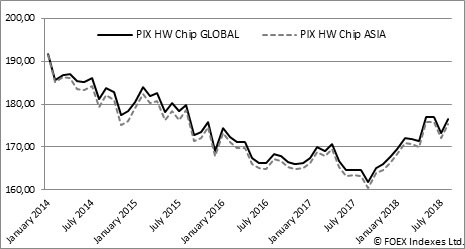 Already currently the majority of the data included in PIX Hardwood Chip Global index is for woodchips delivered to Asia. A historical comparison of the PIX Hardwood Chip Global index and an Asia only hardwood chip index show very little difference in values (see below). For the time being, PIX Softwood Chip Global will remain as it is. FOEX will undergo a consultation on this proposal, with the potential that the changes would take effect starting January 15, 2019. For comments and queries, please email info@foex.fi, by November 30, indicating “PIX Hardwood Chip Global” in the subject line of the email.